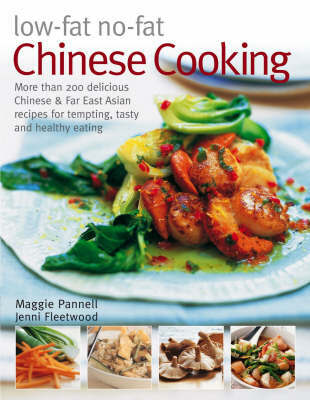 Chinese cuisine may not be the first food to come to mind when considering a no-fat eating regime, but this book shows that it is possible to enjoy all the flavours, textures and fabulous tastes of Chinese cooking while maintaining a healthy, low-fat eating plan. It uses the enticing herbs, spices and rich regional ingredients of traditional favorite recipes and with just a few simple changes, reduces the level of fat. For the first time you can enjoy Far Eastern meals that are so tasty you will simply not believe you are allowed to eat them - like stuffed chillies, duck with pineapple, sticky pork ribs and tomato and beef soup. A comprehensive introduction includes everything you need to know about ingredients, flavourings and seasonings. A techniques section explains the secrets of preparing and cooking Chinese ingredients and there is an invaluable guide to equipment. The recipe section includes over 150 fabulous ideas for every occasion from quick-and-easy to formal meals, including fabulous recipes for soups and starters, fish and shellfish, poultry, vegetables, rice and noodles and desserts. Famous, classic and familiar favorites, such as chicken with cashew nuts, duck with pancakes and sweet-and-sour pork are offered in specially low fat versions; these are matched by innovative newly-developed dishes like monkfish and scallop skewers, gong boa prawns and savory chiffon custards, included because they are healthy without sacrificing deliciousness and flavour. For lovers of good fresh food using exotic, robust ingredients, who also care about their health and the fitness and vitality of their families and friends, this books provides the ultimate in tempting, indulgent cooking ideas that are mouth-watering, easy to make and good for your heart and good for your tastebuds at the same time.